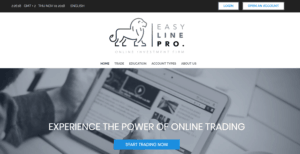 Easy Line Pro Review 2018 | Is Easy Line Pro a Scam or Legit Forex Broker? Beware Easy Line Pro is a Non-Regulated broker. It is NOT SAFE to trade. Easy Line Pro is a forex broker, owned and operated by Solutions CM LTD., a company based in Sofia, Bulgaria. Although it claims to be registered in Bulgaria, it is not regulated in the country by local Financial Supervision Commission and there are no records about it being regulated by any other authority. As a general rule dealing with unregulated brokers is risky and we recommend that clients choose properly licensed and supervised brokers like the charges of UK’s FCA or the Australian Securities and Investment Commission (ASIC).